As I sit here watching the rain fall on Cape Cod, I wanted to nudge everyone to get some counts in on your garden flowers. Many of you won't have your Lemon Queen sunflowers up yet so, we'd love some counts on the other flowers in your garden. One of our main goals is to figure out what the BEST plants are for flower gardens in different parts of the United States. It turns out most of the information about what to plant is based on intuition and not data. We'd like to see how good intuition actually is! Plus, as a science geek, I really like actual data. There was an interesting study done by Mihail Garbuzov and Francis L. W. Ratnieks comparing visits to garden plants in Sussex England. 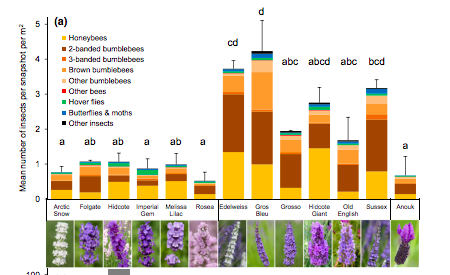 Even among the different varieties of lavenders, there are huge differences in how well pollinators like them. In the graph below, each column represents the number of visits each variety received. So, a tall column means it was a good pollinator plant and a short one means it is poor. Edelweiss and Gros Bleu were clear favorites! If you can't see the image, you can see this newsletter on the website.. The different letters indicate ones that were statistically similar. If the letters are the same, the researchers couldn't detect differences. If you are interested in reading the paper, here is a link. We hope you can help us figure things like this out for our gardens in the United States.